The inline zinc anode is attached to the bonding wire thereby protecting all metal parts against the effects of galvanic corrosion. Protect heaters, pool lights, and rails from damage due to galvanic corrosion. Inline Zinc Anode for new installations 4 feet of #8 copper bonding wire included. Established in 1965 as a subsidiary of a Southern California based pool service and repair company, Pool Tool Company started out with one product. Today Pool Tool manufactures many different time-saving, problem-solving tools for the pool service professional and repair industry. Stainless Steel Deck Anchor Cup is designed to eliminate the problem of galvanic corrosion between two different metals in contact with each other. 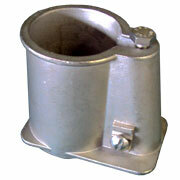 A stainless steel rail in a brass or aluminum anchor cup will fuse together making the removal of the rail impossible. Eliminate this serious problem in salt water pools! Fits standard size 1.90" handrails and ladders. Made with #304 Stainless Steel.